A team led by the National Center for Appropriate Technology studied opportunities to create value-added food products from sustainably-grown fruits and vegetables, a market sector that appears ripe for growth in Texas. We took a “Farmer First” approach, focusing on the needs of growers and the goal of increasing their net incomes. We did extensive market research, educated producers, engaged rural civic and economic development leaders, and built linkages with food buyers and other food industry professionals. Our study confirmed that there are good opportunities for growers, especially for making products at small scale and selling them via direct marketing, taking advantage of Texas Cottage Food Law. We evaluated several promising value-added products and saw special opportunities to work with towns located within 50 miles of major cities, creating jobs through small-batch food manufacturing. Institutional and wholesale markets for processed foods are virtually untouched in Texas, and are a growing opportunity. We created a directory of resources, several cost-calculating tools, and a decision-making workbook for growers. We gave more than 20 presentations and workshops: raising awareness of opportunities, educating growers about food safety and other essential topics, and sharing our findings and tools with communities throughout the Southern SARE region. For more information about the Beyond Fresh project, contact Co-PDs Mike Morris (mikem@ncat.org), Robert Maggiani (robertm@ncat.org), or Sue Beckwith (sueb@texaslocalfood.org). Objective 1. Research opportunities for value-added processing of sustainably-grown fruits and vegetables in Texas, with special attention to the appropriate scale of production. Objective 2. Increase the sales and profitability of value-added products by sustainable and organic fruit and vegetable growers in Texas. Objective 3. Educate and organize growers, facilitating key decisions about topics such as appropriate business structures, values-based branding, sustainability requirements, and scale of production. Objective 4. Cultivate increased collaboration, coordination, and support for value-added enterprise development in the sustainable and organic sector by strengthening inter-industry value chains and rural-urban linkages and quantifying regional economic impacts. In our conversations with small, mid-sized, and diversified farms in Texas over the past few years, many have reported declining net incomes. Some blamed competition from numerous food delivery and “meal-in-a-box” services. Others felt that farmers’ markets were proliferating faster than consumer demand. This statement from Gary Rowland of Hairston Creek Farm is typical: “We’ve been farming for over 20 years and now we have to sell at six markets a week to earn what we used to earn at two markets.” Time after time, growers told us that they saw value-added enterprises as the best hope for increasing their net incomes. By “value-added” we mean (approximately) food that is prepared in some way that increases its economic value, instead of being sold fresh and whole. Hence our project name: Beyond Fresh. It’s not hard to see why value-added products are appealing to growers. When all goes well, multiple factors work to the farmer’s advantage, enhancing profitability and consumer appeal. 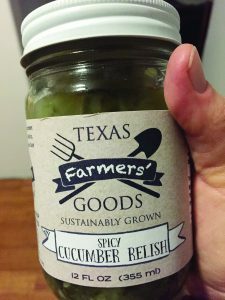 Value-added products typically have a long shelf life, and a zucchini or cucumber in a fermented relish can be worth more per pound than it would sell for in a fresh, whole state. Blemished fruits & vegetables can be worth dramatically more. Moreover, the cottage food laws in most states have opened up a range of new opportunities: prepared foods that can now be made legally in a home kitchen and sold directly to consumers. We undertook this project at the direct request of growers. They wanted to know more about the issues and risks associated with value-added processing. They wanted to know the scale at which value-added processing would benefit them most. And for each value-added enterprise that looked promising, they had many specific questions about up-front capital investment, operating costs, and the requirements of manufacturing, marketing, storage, distribution, and branding. We set out to investigate the opportunities for selling value-added products that are both local and made from sustainably-grown (or organic) ingredients. Our primary focus was central Texas, which offers an ideal combination of strong markets and the greatest concentration of sustainable growers in the state. The importance of value-added enterprises to rural economic development is widely acknowledged. In fact, a major objective of Southern SARE is to “strengthen rural communities by creating economic conditions, including value-added products, that foster locally-owned business and employment opportunities.” We had many questions about rural economic development in Texas, and included an economist on our team with a special interest in rural development. At least in theory, value-added products offer higher profit margins and sales opportunities during the off-season. They can mitigate risk factors such as fluctuating production levels and open possibilities for growers to move beyond direct sales and into wholesale marketing. And the potential market for these products is tremendous. 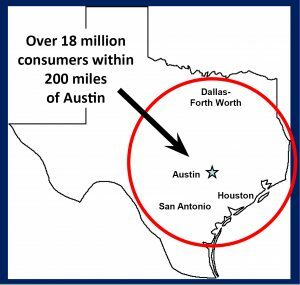 Within 200 miles of central Texas there are at least 18 million people, including the cities of Austin, Houston, Dallas, and San Antonio. The marketing pathways from farms to these enormous populations of consumers appear to be extremely under-developed. Brown, Cheryl, and Stacy Miller. 2008. “The Impacts of Local Markets: A Review of Research on Farmers Markets and Community Supported Agriculture (CSA).” American Journal of Agricultural Economics 90(5): 1298-1302. Dandrew, Bob, 2013. Hudson Valley Food Hubs Initiative: Research Findings and Recommendations. Local Economies Project, The New World Foundation. Swenson, D. 2008. Estimating the production and market-value based impacts of nutritional goals in NE Iowa. Ames, IA: Leopold Center for Sustainable Agriculture.